On new construction, large ceiling joints are covered by the general contractor and the mortar joints should be as smooth as possible. Coating Process Apply chopped roving and resin with two component chopper spray machine. On car washes that are being renovated, surfaces to be fiberglassed are thoroughly sandblasted to remove residue and loose paint. After the appropriate primer is applied, fiberglass is then applied. The final product is a one place, waterproof liner that dirt, road grime, and mildew will not adhere to. 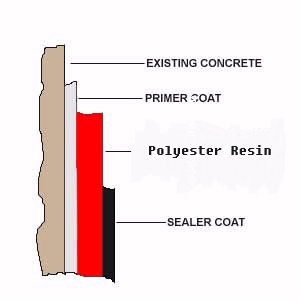 Fiberglass will not peel as paint will, and rinses clean easily. All clean up work shall be done by Contractor to Inspector's approval.